Here is shown how you can bypass the current pulse converter in a SONY XA50 CD player. The upgrade is primarily intended to show you connect a ZAPfilter or other (balanced) analogue stage directly to the primary DAC of the XA50. However you can also use the signal directly, bearing in mind that it is fully balanced, and has a DC component of 2.5 Volts. 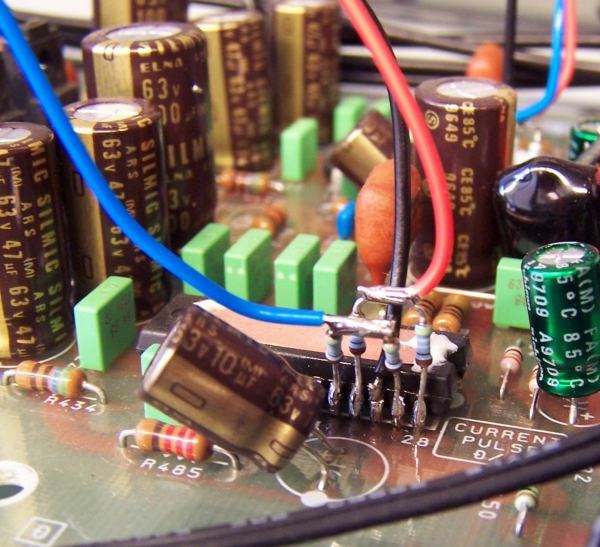 Direct use as an unbalanced signal is not recommendable, because the DAC chip produces common mode noise that is supposed to be filtered out in the balanced process. 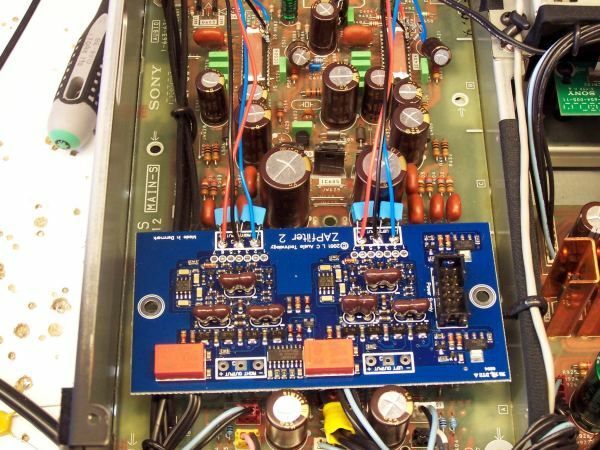 Below you can see the connections to the CXA8042 Current Pulse DAC chip, the old analogue stage can remain intact and functional, so you can actually A/B test the quality of the old and new output. We take the signal out through a set of 4 pcs. 4k99 resistors in each channel. This is because the signal is 0-5V digital signal that we want to get out as an analogue audio signal. Here shown LEFT channel, same applies to RIGHT channel. 4k99 resistors as shown are adequate for connection to the ZAPfilter or other analogue stage. If you want to use the signal directly use smaller resistor values, like 499 Ohms instead. After the resistors each signal line must be decoupled to GND with a 470 or 560 pF capacitor. The black wire in the middle of the connections is GND. The RED wire is +signal, and the BLUE is -signal. 1..Black wire to the mid square terminal of ZAPfilter Input. 2..Red wire to +input terminal of ZAPfilter Input. 3..Blue wire to -input of ZAPfilter Input. 4..470pF capacitor from +Input to GND (Square terminal). 5..470pF capacitor from -Input to GND (Square terminal).